The life of Graceanna Lewis is a story in two parts. Lewis was born in 1821 in Pennsylvania into a fiercely abolitionist Quaker family. Her parents were well-known abolitionist leaders and the Lewis homestead was a station on the “Underground Railroad”- a network of safe houses and secret routes used by escaped slaves on their way to freedom in Canada. Through the Civil War, the Lewis family is credited with saving the lives of hundreds of former slaves. Graceanna was educated at the Kimberton Boarding School, run by botanist and social reformer Abigail Kimber, who was a profound influence upon Graceanna’s interest in botanical study. With Kimber as a role model, Lewis would teach botany and the sciences at several schools prior to the Civil War. 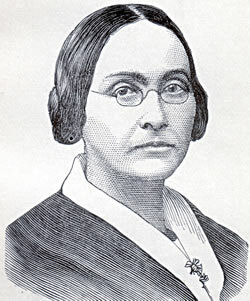 With the end of the Civil War and the emancipation of the slaves, Graceanna Lewis turned her attention fully to scientific inquiry, particularly in botany and ornithology. In the 1860s, she studied under and was mentored by the prominent ornithologist John Cassin at Philadelphia's Academy of Natural Sciences. In 1867, Cassin honored Lewis by naming the White-edged Oriole (Icterus graceannae) after her. By 1865, Lewis was teaching ornithology in private classes. In 1868, she published Natural History of Birds, considered to be the first comprehensive monograph on American birds. Graceanna was unsuccessful in her attempts to secure a teaching position in a college or university setting, as such professional opportunities for women in the 1870s were few and far between. However, she was well-known and widely respected by her peers in the scientific community. Graceanna’s botanical paintings were displayed at the 1876 Centennial Exposition in Philadelphia, drawing glowing reviews from scientists including the British biologist Thomas Henry Huxley. In 1893, she exhibited paintings for the Pennsylvania Forestry Commission's display at the Chicago World's Columbian Exposition (better known as the Chicago World’s Fair). The paintings were publicly displayed again at the 1901 Pan-American Exposition in Buffalo, New York, and the 1904 Louisiana Purchase Exposition in St. Louis, Missouri. 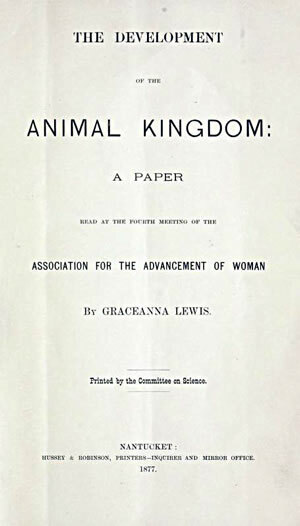 In addition to her illustrations, she published papers in prestigious academic journals such as the American Naturalist and Proceedings of the Academy of Natural Sciences. Graceanna Lewis died in 1912 at the age of 90. Based in part on material by Dr. Rob Lukens, prepared for the Chester Historical Society, West Chester, Pennsylvania, 2013. - Portrait from Collections of Dickinson College.